"A backs to the wall zombie shoot 'em up!" 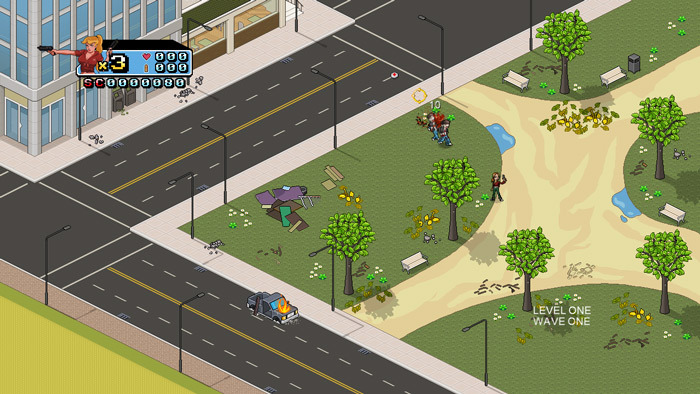 Zombusters is a 3D 3rd person shoot ‘em up game where you have to fight off hordes of zombies. Apparently the game was originally developed over 5 years ago and released on Xbox and Windows phone before being updated for PC release. The premise of the game is good although quite similar to a recently reviewed game here on RockyBytes in its premise of ever increasing enemies coming towards you in waves that keep increasing in numbers (although the other game is far superior go check it out here). At first glance this game looks like simple fun and to an extent it is for maybe the first three or four waves of zombies but there is a strange bug that means your character can get stuck when trying to run around and avoid the zombies even though there is no visible object in front of them which can be rather frustrating. The second issue we had with Zombusters is that one of the games’ most advocated features is the power ups and during 10 waves of zombie attacks we only upgraded our gun once and picked up a couple of extra lives meaning that the game play can become very repetitive. Whilst the music used is very cool and the intro screen animations are very enjoyable the game itself has too many little flaws to make it something you would want to play repeatedly, however if you are a big fan of shooting zombies (and let’s be honest who isn’t) then you will probably get a kick out of this even if it is only for a few minutes. You can download Zombusters here for free.